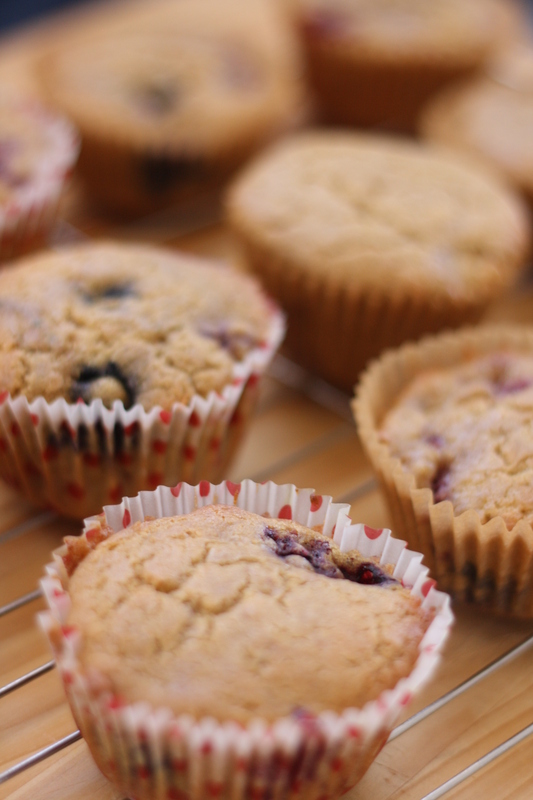 Muffins have become an old standby for a quick dessert, or snack, in our family. We have made them both savory, or sweet, depending on the season, and/or what ingredients are available to us at the moment. Looking through the freezer the other day, I came across the last bag of frozen mixed berries (raspberries, blackberries and blueberries), that beckoned to be used. We also still had a small amount of white chocolate chips left over from the holidays. Voila – a new recipe was born. Since so many gluten free baked goods lack fiber altogether, we have made it a point to add rice bran to many of our recipes. Due to our own sensitivities to most of the commercially available bean and corn flour products, we are somewhat limited in the selection of flour products we can use. Overall, what works great for us are all varieties of rice, tapioca, almond and coconut flour. On this particular day, the pantry needed to be restocked and all we had left was rice and tapioca as well as rice bran. But that is what is so great about muffins, you can allow your own creativity free reign, only limited by what is available to you. This recipe makes 18 muffins. Preparation time is about 10 minutes and it is very easy to prepare. You will need the appropriate sized muffin pans and liners. 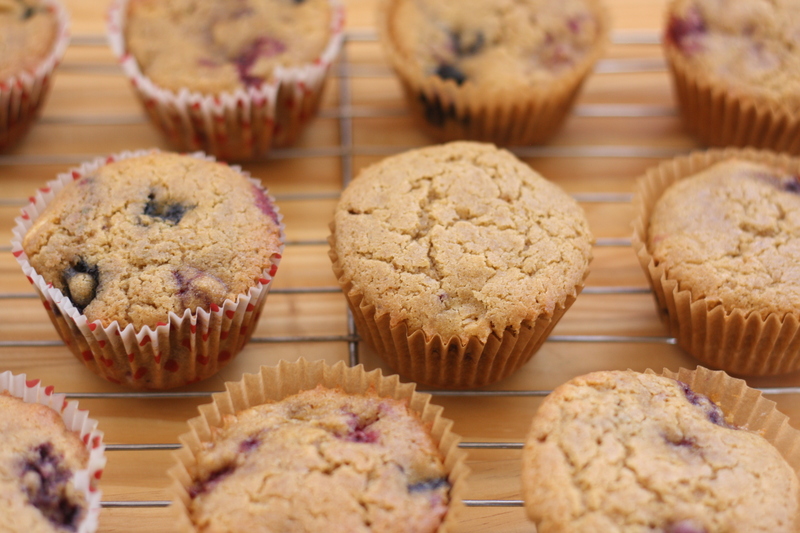 Line the muffin pans with your favorite muffin cups and set aside. In a large bowl, cream the butter, sugar and vanilla extract, using a hand mixer. Add the eggs one at a time. In a separate bowl combine the flour, rice bran, salt, baking powder and guar gum. Alternately, begin adding the flour blend and coconut milk to the creamed butter mixture, setting your mixer on a very low speed. When all the flour is well blended, set aside the hand mixer. To avoid breaking up the fruit and chocolate, the next step will have to be done using just a large spoon. Add the chocolate chips and berries into the batter and mix well, careful not to break up the fruit. Fill the muffin cups and bake for about 22-24 minutes. The muffins should be just a light golden color. Remove from the oven and let cool in the muffin pans for at least 5 minutes before turning them out onto a wire cooling rack. The whole house filled with the wonderful aroma of berries and chocolate. 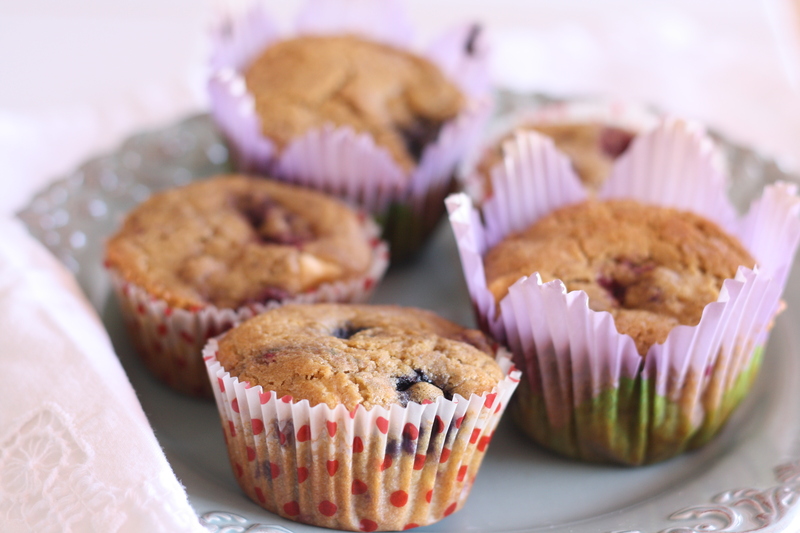 The muffins were just right – moist and chewy with just the right amount of sweetness and the enticing flavor combination of berries and white chocolate. Definitely one we will make more often. Let us know, how yours turn out. 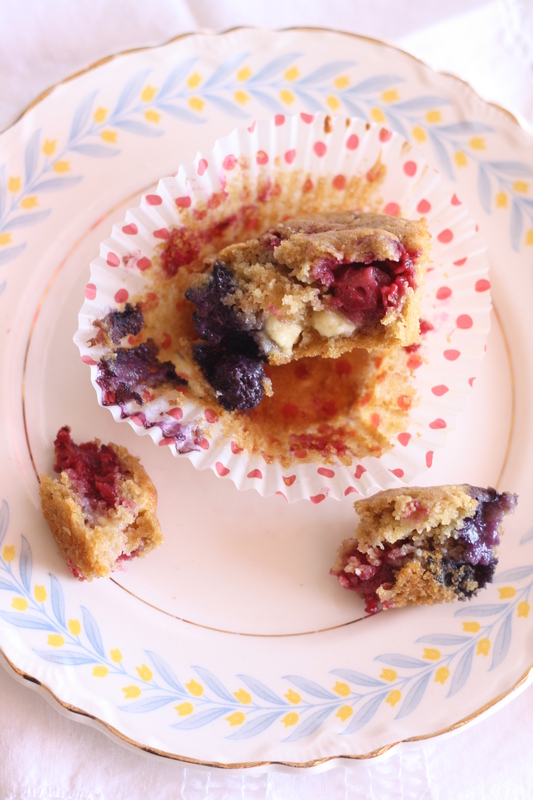 Love the fillings in these muffins — yummmmm! 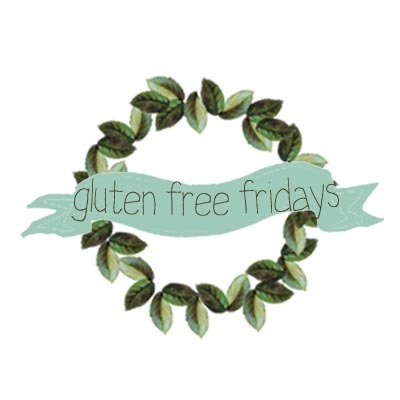 Thanks for linking up with us, we’ll see you next Friday.